After a hard-scrabble life of over 60 years, and after the roughshod course of a couple marriages and the tragic loss of most of her children, Tressa Prisbrey decided when she settled in Simi Valley with her third husband, Mr. Prisbrey, that it was time to properly display her lifelong pencil collection numbering over 17,000. (I know this sounds like an entry in a Wait Wait…Don’t Tell Me!’ segment, Bluff the Listener, but trust me, I’m not making this up.) Concrete block for the walls was beyond her budget, so she headed to the local dump, where the building materials were the right price. 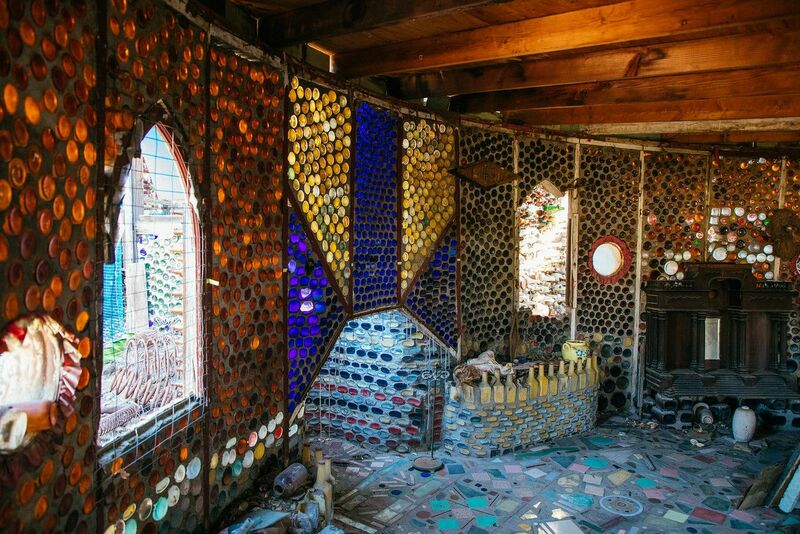 I suppose outsider art by definition must have a quirky origin story, but it seems whatever the impetus, the function of the bottle houses evolved to protect mementos of her children and all the detritus she clung to during her peripatetic life, sheltered by the walls she made with the bottles she retrieved from the local dump. 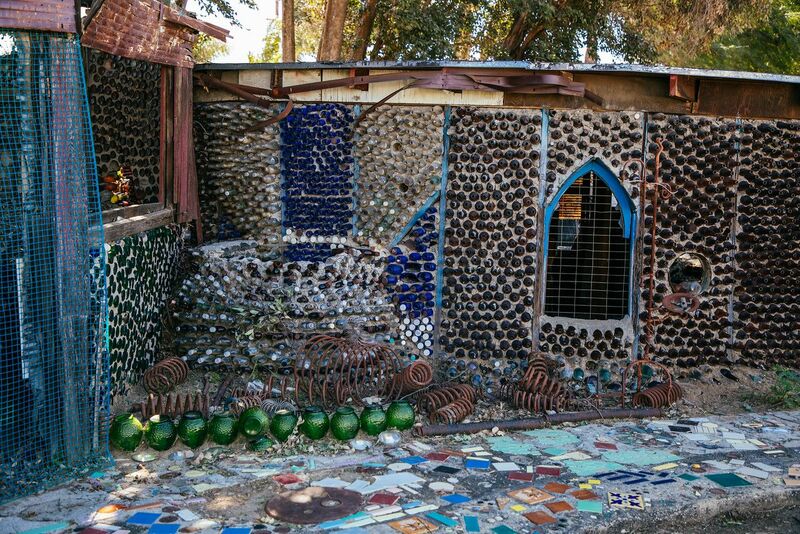 To ruthlessly condense a remarkable story even further, this homespun shrine is now known as Grandma Prisbrey’s Bottle Village and has been deemed California Historical Landmark No. 939 as well as being listed on the National Register of Historic Places. 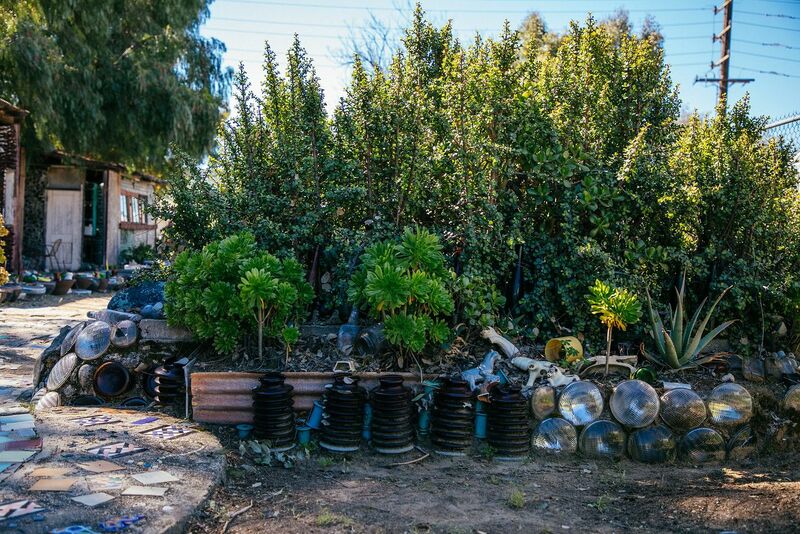 A friend of Mitch asked him to photodocument the site, which has been crumbling since the 1994 Northridge earthquake, in need of funding for repairs. There’s so many bizarre facets to this story, among them the rare instance of a woman (who had her first of seven children at the age of 15 by a husband 37 years her senior) being a practitioner of this kind of folk art/assemblage, especially in the mid 1950s. In these photos I see a busy innocence at play that miraculously was still intact and unscathed after a calamitous life of near constant sorrow. And on a technical level, I’m also struck by the realization that, in contrast to the 21st century, there must have been a relative purity to the public dumps she rummaged through in the 1950s, which lacked the complex plastic waste overflowing ours. 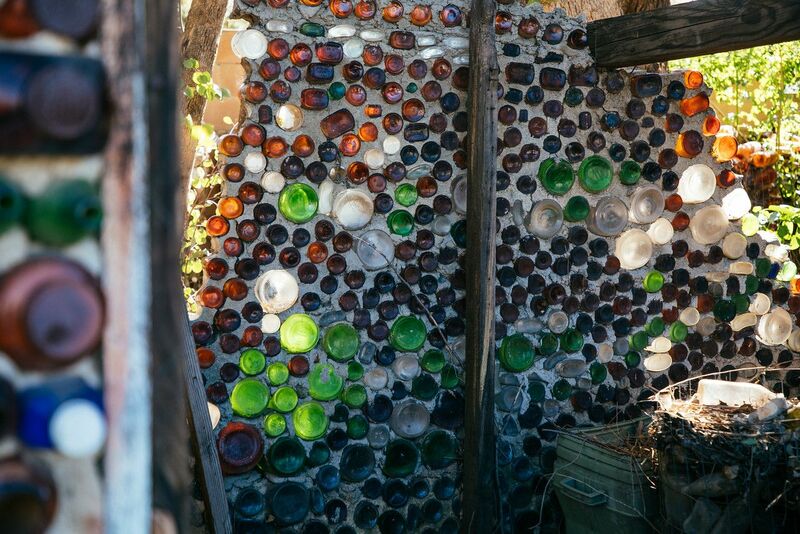 Who knew that our recycling infrastructure in 2019 would be about as effective in reducing waste as one woman’s bottle village? 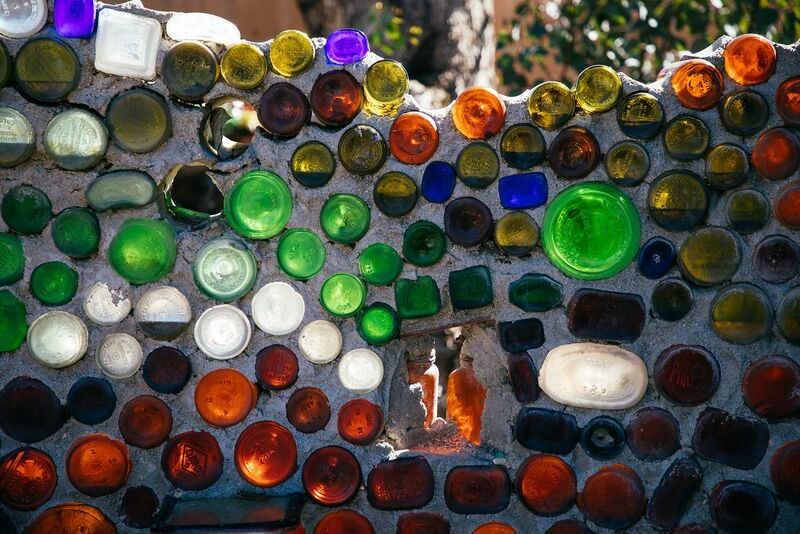 Waste Dive has helpfully compiled information on “How recycling is changing in all 50 states,” where you can look up your state to check on the current status of recycling your trash. 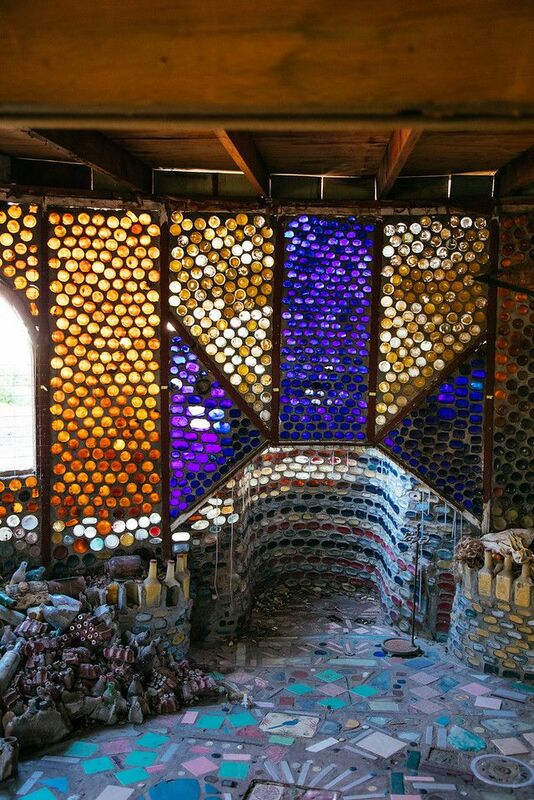 For the moment, unlike the bottle village, it isn’t a pretty picture. 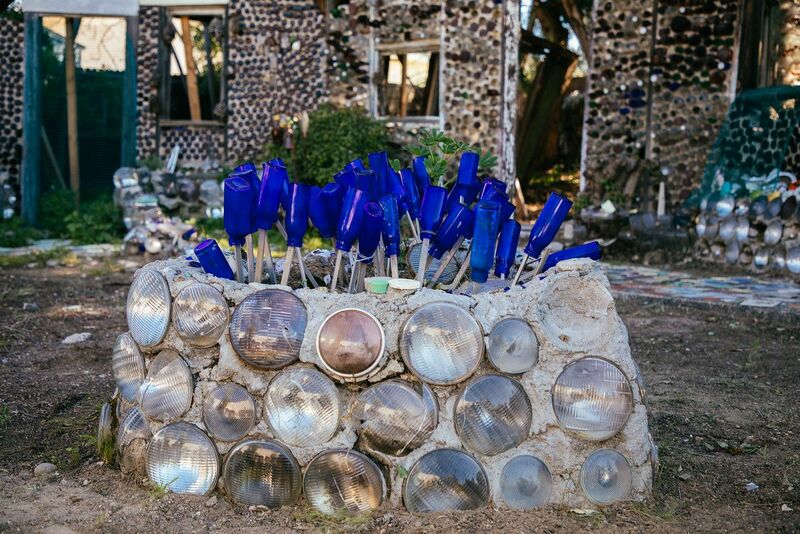 This entry was posted in artists, MB Maher and tagged outsider art, recycling. Bookmark the permalink. I am trying really hard to stay away from plastic, and trying to think back to the 50’s and early 60’s when there was so much less of it. I have returned to the world of waxed paper, have little paper bags for on the road snacks and beeswax fabric for wrapping some of the refrigerated items. Who knew what foreknowledge the dude at Benjamins’ graduation had. And the phones were made of bakelite. Not so great either ! I’ve become more conscious of the amount of plastic my household consumes and much less accepting of its gratuitous use (e.g. in packaging cosmetics) but, unlike Kathy, I haven’t mounted a major effort to reverse the trend beyond avoiding plastic bags and straws. Our generation embraced a economy that encourages disposability of objects of all kinds and I fear that’s going to be a hard trend to reverse. 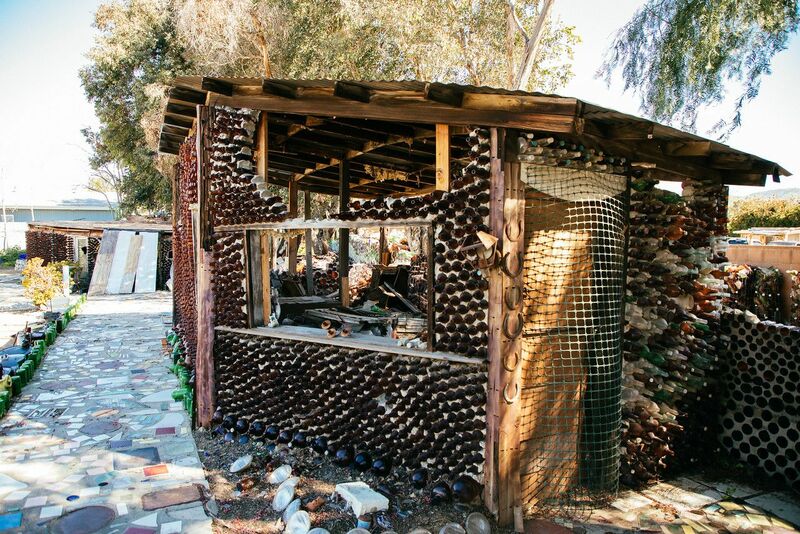 We tell visitors to South Coast Botanic Garden that the garden was built on top of 3.5 million tons of trash, citing this as a positive example of land reclamation, but building homes and businesses on top of landfills would be much more difficult – after nearly 60 years, the garden is still settling as the decay below ground continues. A large part of the solution is not producing so much plastic in the first place. However the oil industry is looking to plastics to replace the demand that will hopefully decline as we hopefully move from carbon cars to EVs. I don’t miss plastic grocery bags and don’t miss plastic straws, and wish there was a lot less packaging of everything. The only thing I can do at this point is avoiding buying stuff. A local nursery will take back plastic nursery containers and reuse them. At least there is that, and I can still buy plants without feeling extremely guilty! Beautiful photos, your comment “In these photos I see a busy innocence at play that miraculously was still intact and unscathed after a calamitous life of near constant sorrow” caused me to go back to the beginning and start over, really looking at each image. Interesting story of this cool place. So much to think about. I am daily disgusted by the amount of plastic that schools toss in the garbage.